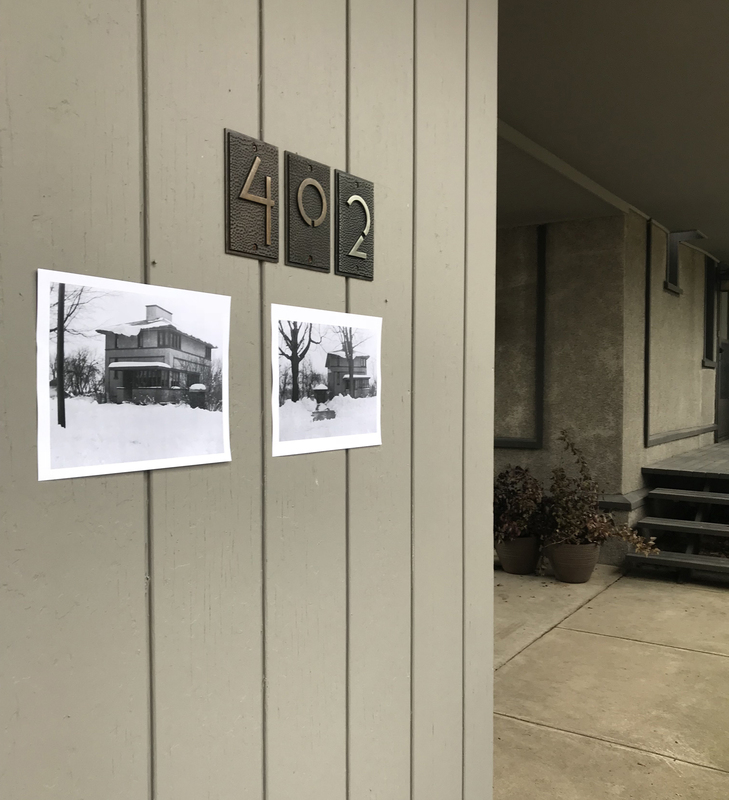 Copies of photos from the 1920s are taped to the garage wall to show visitors how the house would have looked before additions. 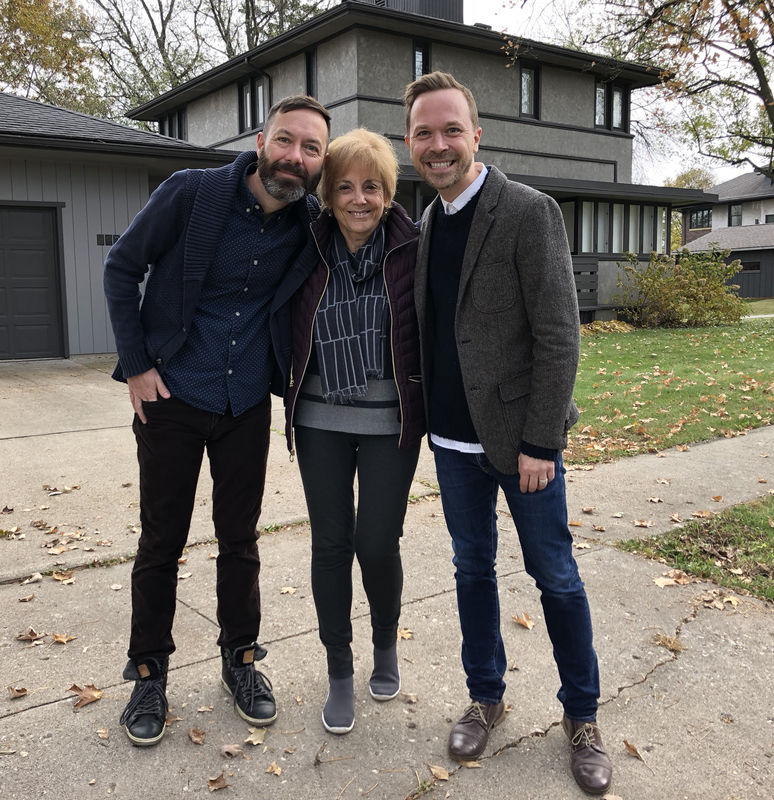 We knew when we bought the Delbert Meier House that we would receive visits from people interested in Frank Lloyd Wright and the American System-Built Homes. The couple we bought the house from – who had only owned it for about three years – attested to this at the closing by sharing stories of drop-ins. And they were correct – we started getting visits from those interested in the house and its history almost immediately. Fortunately, the advance warning from previous owners had given us a nudge to learn as much as possible about American System-Built Homes and the history of own house. If we’re going to fill the role of docents at our own house, we figured, we’re going to arm ourselves with ALL information! 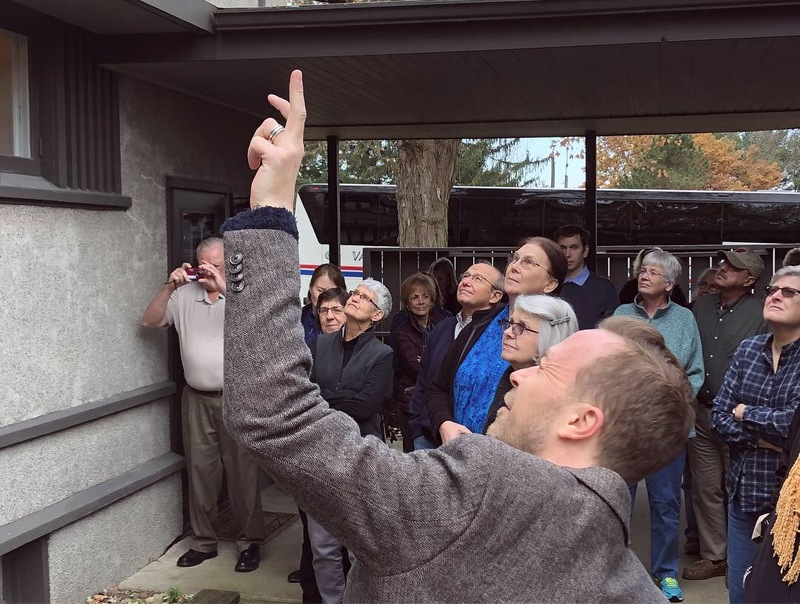 In the past five years we’ve welcomed visits – some pre-arranged, others wholly impromptu – from architecture buffs who’ve learned about our house’s unlikely location in small town Iowa. I say unlikely because ours was only the third Wright design constructed in Iowa. Also, of the American System-Built homes, ours is the westernmost model (as far as we know). We’ve pre-arranged visits from Wright fans who have travelled from other points in the midwest. We show them around the house – inside and out – and give them a thorough history of the house’s ownership, including details on when the additions were constructed and the built-ins pulled out. We’ve given impromptu tours of the house when we’ve seen a car slow to a crawl and a camera pointing toward the house. One time last summer, The Mister was mowing the yard when, out of the corner of his eye, he saw a man standing in the front yard. The MIster shut off the mower and approached the man, who, as it turns out, was visiting from Australia and attempting to see all the Wright sites in the US. 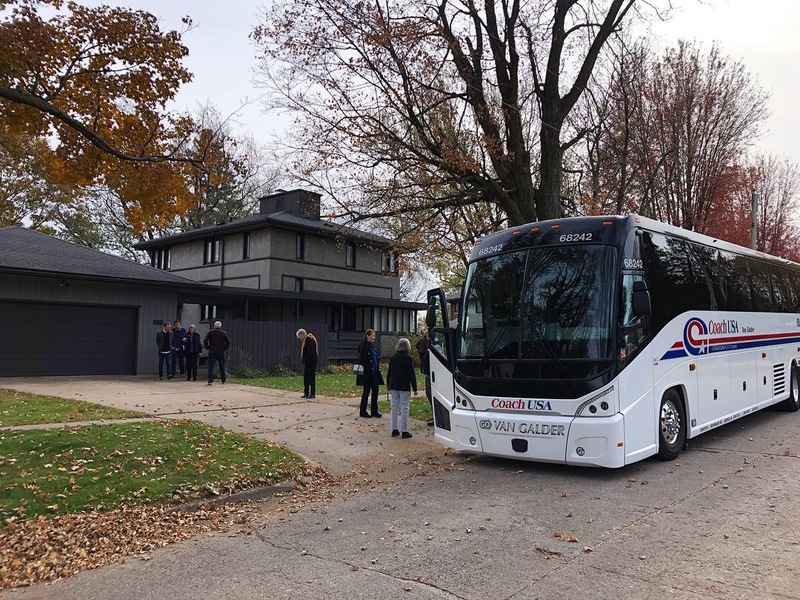 All of these visits were the perfeect preparation for what we experienced in October – a tour bus full of Wright aficionados who were making the journey from Milwaukee to Mason City and wanted to stop at our house along the way. We agreed to the visit months in advance and yet still found ourselves scrambling to “stage” the house when the day of the visit finally arrived. And let me tell you – nothing encourages a person to spruce up a house quite like the prospect of thirty people coming to walk through it! A literal busload of people came to see our house! The visit was scheduled to last only an hour but you would think that we were preparing for a day-long symposium. There’s so much information to share about our house and the ASBH project that we tend to ramble. So we wrote ourselves a little script to keep us on track and make the most of the sixty minutes allotted to us. We met the group in the driveway as soon as their tour bus pulled to a stop at the curb. We started on the outside of the house – pointing out the original features like the stucco and carriage house while also explaining the additions and alterations that were made by a previous owner – before moving inside and giving the group free reign to look around. The people in the group were friendly, inquisitive and patient of our tendencies to go on and on about the details of our house’s ownership. The sixty minute tour went by in a flash! One of the reasons we bought the Meier House was to reclaim it, gussy it up and tells its story. Five years into ownership, we’ve lost sight of that. This visit from the Wright in Wisconsin group was a wonderful reminder to keep plugging away. To loosely quote a sports movie I’ve never seen, if we gussy it up, they will come. This entry was posted in American System-Built Home, architecture, Frank Lloyd Wright on 01/22/2019 by Jason. Every home should have such good stewards!